One of the hardest decisions when you visit Paris just might be where to stay. The city has an abundance of hotels – from budget to boutique and luxury. Whether you want to splash the cash or tighten your belt, you’ll find all your needs catered with this wonderful selection of Paris stays. Luxury hotels are highly desirable, especially for first-time visitors with the budget. But the smaller boltholes, boutique hotels, and private villas in exclusive residential areas are just as popular, offering insider intel on neighborhood gems, from cafes to beaches. They’ve got access to a more authentic slice of local life – and, of course, greater privacy and flexibility. We’ve combed our sources and asked our industry friends (Travel Bloggers and writers) to bring you our picks the best hotels in Paris, and you can’t go wrong with any of them. When opened by César Ritz in 1898, this was the most innovative hotel in Paris; the first to have lifts, electricity and private bathrooms. While presumably adding vast amounts of hidden cabling and replanting the garden courtyard, the renovated hotel has preserved its period furniture and paintings à la Louis XV, and kept some of the cult features like the laugh-at-them or loathe-them gold swan taps in a mix of sleek and scruffy. In contrast to the unknown who want to be seen coming in here, the famous can sneak in with direct access from the Place Vendôme car park. This is a place for playing at being Marie Antoinette, and indulging in tea and madeleines in the Proust library salon or cocktails in the Hemingway bar. Click here to book! Named after an 18th-century socialite, Hotel la Belle Juliette leaves a sweet taste in your mouth, thanks to its confectionery-coloured interiors, hideaway spa and fresh-from-the oven Parisian breakfasts. The modern and elegant, Green Superior Room in the garden wing is charming, primped with bold colours, scorched-wood floors and sensuous mid-century furniture in a nod to Juliette’s daring, art-loving side. These rooms are equipped with a double bed, an iMac for surfing the web, a bathroom with walk-in shower or bathtub, and a separate toilet. To help you relax or work, a Nespresso coffee machine is also provided. Click here to book! Hôtel Le Clos Médicis is our go-to hotel when in Paris: perfect for someone traveling on a midrange budget that is looking for an impeccable location, Hotel Le Clos Medicis delivers the perfect balance of allowing you to stay somewhat budget-minded while not compromising on where to stay in Paris. Located just steps from the Luxembourg Gardens, the Pantheon, and a metro stop that also houses the RER B line (meaning it’s incredibly simple to reach the airport! ), Hotel Le Clos Medicis also makes it simple to head further afield–it’s less than a 20-minute walk from Notre Dame and all that Il de la Cite has to offer. While the hotel rooms are small (as is the norm in Paris), they are clean and well-kept, the staff very friendly, and the lobby lovely. One small quirk? They don’t allow food in the rooms – but there are plenty of delicious restaurants, both French and international, are just a short walk away! Hotel Monte Cristo in Paris is a 19th-century odyssey, by Alexandre Dumas that is the book that was used as an inspiration for this hotel. 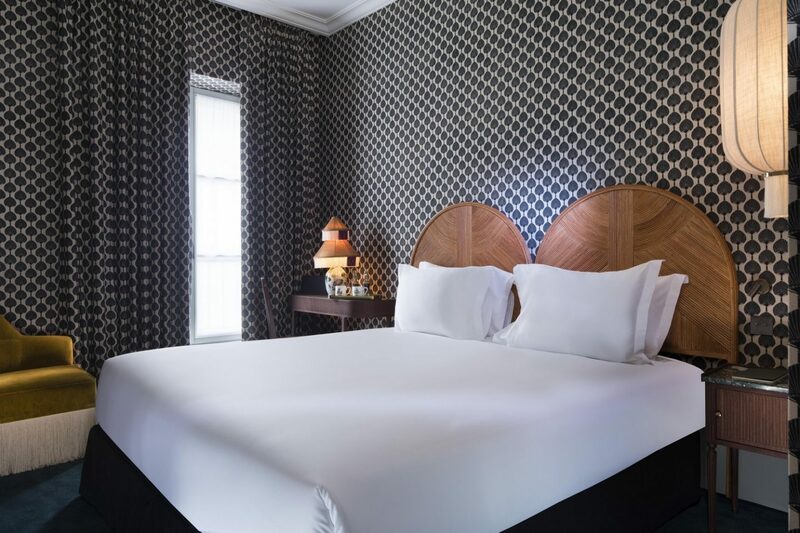 Each element of the Left Bank boutique hotel’s 50 standard rooms, 3 suites and 4 boudoir rooms was inspired by the literary hero’s travels, including rooms that resemble far-flung boudoirs, decorated in custom tapestries, rich velvets, dark woods, fringe-hemmed divans and transporting art. Downstairs, a sauna and palm-dotted indoor pool conjure the tropics in the heart of Paris. After a day strolling the city, plot new adventures in the clubby Bar 1802, home to the largest selection of rums in Paris, including house-aged pours. It’s an oldie but a real goodie! Click HERE to book! Majestically located in between the Eiffel Tower and Les Invalides, the Narcisse Blanc Hotel-Spa watches the city through its windows, but remains far from the hustle and bustle of the city, in absolute calm. Never flashy, always discreet and luxurious, the rooms play upon delicate, light, cream-coloured tones. Art Deco, Art Nouveau and modern furniture come together in perfect harmony with ravishing fabrics like velour, tweed or silk. To prolong the peace, there’s a spa complete with a pool, Jacuzzi and elegant relaxation beds, plus a sauna, hammam and massage room. Other added extras include terraced gardens and rooms for hire. Click here to book! The 4-star hotel located on the Rive Gauche in Paris’s 7th arrondissement features a private garden terrace, where guests can relax with a drink or enjoy meal. The hotel was inspired by art and museums, and every room will take you through the greatest classical paintings of the last century. Click HERE to book a room! This boutique hotel brings together the interiors of design oracle Sarah Lavoine and a menu by Michelin-star-awarded chef Arnaud Faye in a classical 19th-century building smack-bang in the bullseye of Paris. This is a prime base for exploring the city, but you can just as easily escape it: the hotel has a library with a roaring fire, a spa by French beauty house Codage, and an indoor pool with a hidden hammam. Located down a short alley off busy Boulevard Poissonnière that buzzes with shops, brasseries, bars and the famous Grand Rex cinema. 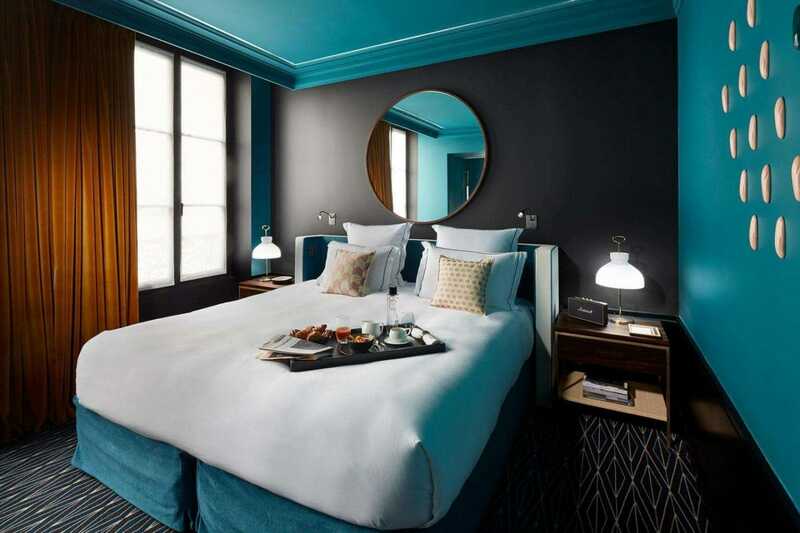 Hotel des Grands Boulevards teams 18th-century Parisian elegance with a touch of avant-garde design. Stately Louis XVI furniture nods to the building’s revolution-era roots, including charming canopied beds and tables topped with fiery Rouge Royal marble, a favourite of the Sun King himself. Adding their own spin to the building’s history, the hotel have also staged a revolution of their own, mingling these aristocratic designs with provincial furniture and rustic linens, tipping their hat to the Tricolore-waving masses that reshaped the country. The hotel restaurant uses locally sourced, organic and fair-trade ingredients; the cleaning products, light bulbs and bath products at the hotel are also environmentally friendly. The hotel has 50 bedrooms, a landscaped courtyard, a cocktail bar and a Giovanni Passerini-conceived menu at the Grand Restaurant. Click here to book! Up a spiral of animal-print stairs, six floors of dramatic, coquettish rooms pay tribute to France’s scintillating women, in a dazzling display of mid-century pieces, silky chinoiserie and Latin Quarter rooftop views. Click here to book!